The NHL lockout has put a damper on current events hockey news. That makes it tough for regular print periodicals like The Hockey News to remain relevant, especially in the digital world. As per usual The Hockey News has released a collectors edition issue. In lieu of current events, THN has embraced the past with The Best Of Hockey History. As expected with all THN's collector issue magazines, this particular issue is beautifully presented with 170 glossy pages and amazing imagery. As can be expected with any hockey history project, there is a mix of black and white and colour photos, making for a wonderful ambience. 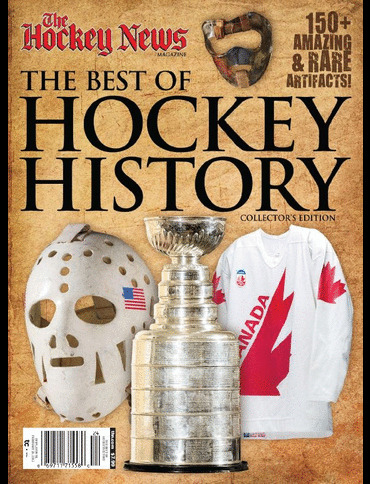 Much of the imagery in the magazine include more than 150 amazing and rare artifacts from the Hockey Hall of Fame. Brian Costello nicely introduces us to the use of these artifacts in the short essay Skating Down Memory Lane. The heart of the issue is the Era Essays. THN neatly divides up the NHL's history in to six tidy eras, with the likes of Bob Duff, Stan Fischler and Ken Campbell offering in depth Era Essays. THN also provides season by season summaries highlighted with top three stories/newsmakers. Leading scorers, significant records, Hall of Fame inductees and the Stanley Cup winners are among the many notes for each season. It all adds up to a beautiful finished piece. I say this every year: The Hockey News' collectors edition magazines are better than their annual book release(s). The presentation is better, filled with colour and graphics. The writing topics tend to be more varied. And the price point, around $10, is much friendlier. This is an excellent stocking stuffer for the hockey fan on your shopping list.